As if Google Docs couldn’t get more cloud-injected and internet-ethereal…. There has to be this Android app called GDocs to make it go supersonic. You can think of this app GDocs as the ultra auto-attendant of the word-processing arena. And there’s no beating it (thank you, Google). Let’s talk business here, people. What’s the one thing that’s so important to any small business, any mobilized entrepreneurial business? Documents. Paperwork, printed stuff, logistics. Yadda, yadda, yadda. But in this day and age, a lot more businessmen out there with their busy call centers doing some of the tough work for them, the ability to carry those documents needs to be mobile as well. That’s why you have things like Microsoft’s SkyDrive and, of course, Google Docs. Unfortunately, for some tablets — and especially smartphones — working with Google Docs is actually quite tough. It’s one thing to work on Microsoft Word on a Blackberry. It’s completely different when you’re dedicated to an online word processing suite like Google Docs. 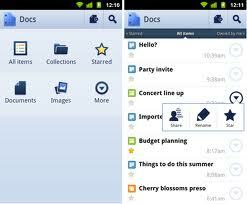 Essentially, this app allows any smartphone/tablet user to view or edit Google documents on the go. No need for a laptop here. You can also import, export, send, and even sync documents with your Google Docs account! Right there on your smartphone, all thanks to GDoc. That’s not all it does: you’ve got…. Talk about convenience…. That’s the name of the game in business these days. And certainly GDocs does deliver. As with any Android-powered phone, it all depends on the kind of phone you get. Not to mention currently this app is compatible with 1.5 Android. Which I think is “Froyo” or something like that. Honeycomb? Ice Cream Sandwich? Sounds yummy. I digress, though. So expect to have some operation troubles if you have a lackluster phone or if your Android version’s too high. Some phones aren’t even compatible at all with the app no matter if those phones operate on 1.5 or lower. The same can go for tablets. So keep that in mind: if you have a lack of the technology in your hands, your Google docs will be lacking in your hands as well. And that’s not good for business. Let’s face it, though: you’re all about advancement. You’re all about getting better at what you do. So if that’s what it takes, do it. Get a better phone. Invest in a better tablet, if necessary. Immediately what follows are the bright and shiny apps to help our businesses reach the clouds in the heavens and sing ‘Alleluia’ (or ‘Kumbaya’). So enjoy it. It’s going to be a great ride. This entry was posted in Android Apps, Halloo, Phone Apps, Small Business, Virtual Office and tagged android app, business, correspondence, GDocs, Google Docs, letters, Microsoft documents, paperwork by Pierre. Bookmark the permalink.